Celebrating famous personalities and political figures on banknotes is now old style. Instead, prepare yourself this April to romanticize butterflies, the sun, snow crystals, and the spirit of adventure in the new line of Swiss currency notes! With the theme for this new series being “The Many Facets of Switzerland”, each note is based on individual concepts, which are light, time, wind, matter, water and language. The notes each have unique and beautiful illustrations in them. Skiers whooshing down a race course, zigzagging between obstacles on the 10-franc bill. The Big Bang Theory and the Large Hadron Collider a masterpiece of technology and innovation is depicted on the 200-franc bill. Other illustrations are that of butterflies, graph lines, and snow crystals. Imagine the logistical nightmare of releasing so many notes at once! So the Swiss decided to play smart and stick to a release schedule. The 20-franc note will enter the market in about six months after the 50-franc note. The rest will ensue in half-yearly or annual intervals in the following order: 10, 200, 1,000 and 100 franc notes, the final of which will be out by 2019. 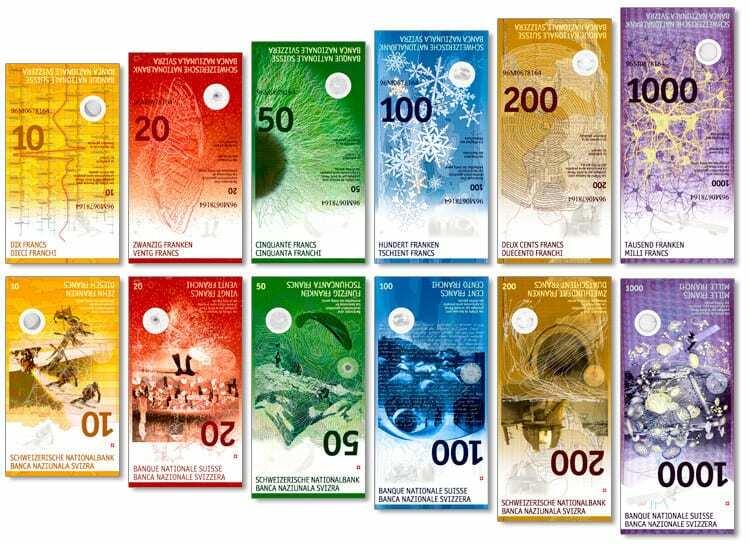 This 9th series of banknotes was to be out by 2010 but due to a delay uncharacteristic of the Swiss, who are world renowned for their clockwork efficiency and excellent banking system, the release date was pushed a further 6 years. Apparently this was caused by the complex security features embedded in the notes for restricting counterfeiting! The paper supplier had technical difficulties in producing paper of the quality required to incorporate the safety features. The note has a 3-layer structure of cotton and polymer making it very durable. They are designed to last at least 15 years. Do not Judge a currency by its name. The Swiss Franc is not only the national currency for Switzerland but also for its neighbouring country Liechtenstein. Did you know? 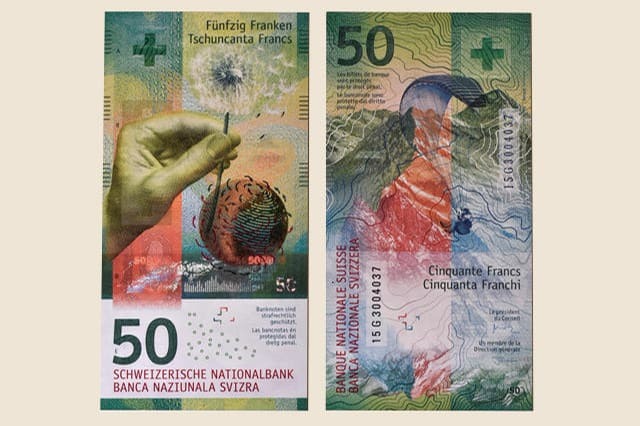 Switzerland has four national languages all of which feature in its bank notes : German, Romansh, French, and Italian. The Swiss Franc is known by 6 other names too : Swissie, Thune, Amiese, Frankler, Stutz, and Liber. Swiss banknotes have a very good track record against counterfeiting than euros, US dollars or the British pound. The statistics are 1 in 100’000 Swiss bills is counterfeit, whereas for Euros it is 1 in 20’000, for US Dollar 1 in 10’000 and for British Pound, 1 in 3333. The 1000-franc note is the banknote with the most value still being printed. Even though there are USD 10’000 bills in existence and being circulated, they are no longer being printed. Singapore has a 10000 dollar bill worth about 7500 francs. The most favourite note of the series for the designer Manuela Pfrunder is the 50 franc note. She say’s that the note tells the story of the wind. It implies that Switzerland is not just in permanent motion but that it also engenders movement. The front side of the note has small arrows indicating the zones and various directions of the wind. Another feature she has embedded into the design is a microtext containing the list of peaks in Switzerland which are above 4000 metres which may be viewed clearly through a magnifying glass. « 10 Breathtaking Countries Where Indians Are Granted Visa-on-Arrival!